I hope you realize you've whooshed through another week already and here you are! No, don't bother turning around. Monday through Thursday are long gone. I'm knee-deep in signing cards, but I had to stop and play in a few challenges! They draw me in like honey to a bear about to hiberventilate . . . I used my NBUS "Pinpoint Dome Tag Decorations" die by Poppystamps to cut the tag elements. I didn't even notice until now that the foo-foo bow completely covers the lovely rounded shoulders of my tag. You'll have to take my word for it. I sponged the snowy sky top and tore the bottom hills. The "Evergreen Trees" are also dies from Poppystamps. The sediment is from My Favorite Things set "Seasonal Sentiments." I used a white organza ribbon for the bow and colored it by skating my blue and green ink cubes over it on both sides to give it the same Hugh as the sky. Jingle Belles: A Christmas card or Anything But a Card. SSS Wednesday Challenge: Anything goes. Tag You're It: Loll Thompson. I do a few cards with this image every year because I never cease to love it. It's a old-timey wooden stamp from The Rubbernecker stamp company. I heat-embossed the image in platinum and then watercolored it with my Ziggies. The shimmery paper and the sediment are from PTI. Less Is More: Emboss resist. CAS Watercolor Card Challenge: Watercolor resist. Thank you for your good wishes about the plumbing. Of course, by the time we could get a plumber, the water was flowing fine. There was no sign of any leak so no one has any idea what happened. All we can do is wait for it to happen again. Wait. What? How's that? Perhaps it was the Elf on the Shelf? Hammy? I guess we'll have to install cameras and motion detectors. 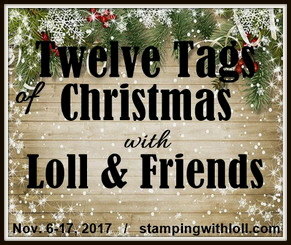 Labels: Addicted to Stamps and More, CASology, Jingle Belles, Less Is More, SSS Wednesday Challenge, Tag You're It! As always lovely creations and super bow on the tag. Hi Darnell, Glad your plumbing problem sorted itself out. I love both of these. I was hoping to do a tag as I love Lolls one it is so bright and beautiful but I don't think I will get there so will be happy with just seeing what others do). Love your interpretation Darnell, its beautiful. Lovely tag and card Darnell beautifully presented as always...so pleased you managed to get your plumbing sorted out..
A stunning tag and gorgeous card Darnell, I love the wonderful colours you've used on the tag. 2 beautiful creations here ... Perfect take on Lol's tag and your card is so beautifully done ... Have a great day! Gorgeous tag!! Love your card also! Gorgeous work, Darnell! I was thinking that the tag looked like Loll's work. You did a fantastic job on it. The embossed and watercolored card is so very lovely, too. Great watercoloring. Well, darn on the plumbing. Hate those random acting issues! Good luck with that! Thanks for the inspiration! Hugs! Darnell - it's always so lovely to read your posts. I absolutely love the sparkle on your lovely trees - the tag is gorgeous. Thank you for playing along with 52CCT this week, but sadly our challenge is only for cards! Love it nonetheless! And that emboss resist card is awesome. Deborah, DT 52CCT. I really like the scene you created on the tag with that beautiful ribbon. Doesn't matter what is in the box with this tag it is certainly a winner. Darnell, your tag is stunning, such a beautiful background and ribbon! So pretty! I just made some tags last night, myself. Happy Holidays. Gorgeous tag Darnell! But the older stamped image stold my heart, there is just something about the older Christmas images that I love. Loving your pretty tag even if I can't see it's beautifully rounded shoulders! The bow is gorgeous. The Christmas card is also wonderful. Gorgeous tag, just like Loll's AND that marvelous card and ziggy coloring! Both are just wonderful! That candle card is awesome - great take on the CASology cue card! Fabulous tag, Darnell! Love the background and all the sparkle. And that swirly sentiment is just perfect! I love your candle card too. That blue looks fantastic! Amazing tag, love the blending and the big bow! Lovely CAS, too, with these bright and sparkling colours! What a lovely case of Loll's tag! The scene is just gorgeous with that sponged sky! The 2nd card is such a beauty too with that great image, and I love the platinum embossing - what a fabulous look!! These are gorgeous Darnell! The tag is a perfect channelling of your inner Loll and looks fantastic! I love your emboss resist card with that stunning olde worlde image and watercolouring. Just right for our challenge at Less is More - thanks for joining in! Wow I love that floofy bow on the tag Darnell! I can dee the inspiration from Loll's tag here! I also love that card with the "old Wooden Stamp"! See you soon! What a GORGEOUS take on Loll's already beautiful tag! And I can see why you grab that stamp every year, it makes for such a pretty, traditional (but, ohh, shiny embossing!) card. Two amazingly different cards and techniques. love both these. That wretched ELF has arrived!!. I'm on the first boat outta here. Well, how gorgeous is that bow?! What a wonderful tag. And I love the traditional stamp you used for your embossed card, I think some traditional images get lost these days with all the modern and cutesie stamps available. I love the platinum with the ziggy watercolouring too. Just STUNNING Darnell, I LOVE Lolls tag, and yours manages to blow that one away!!! Truly lovely tag, Darnell. So dreamy and gorgeous!!! Sorry I haven't been over here to visit for some time!! I miss getting to come by and say Hi, even though I do get to look at your posts by email. Thank you for stopping by my blog with a cheery hello! Love the large bow on your tag. Don''t worry, you can still see your gorgeous tag. Great colours. Two stunning beauties here Darnell, love the colours on the tag and so glam with the bow on top! I'm not surprised you use this stamp every year on your cards it's fabulous, intricate and works superbly with the technique at LIM this week. Gorgeous colouring with the ziggys and a super duper CAS card. I'm thrilled you are up to signing cards ... I'm still in the making process! Crikey need to get a shift on! Hi Dolly. Thank you so much for taking time to play along at Tag You're It! and CASE my tag. LOVE your version. Great background, beautiful bow and lovely texture and sparkle on your trees and snowbanks. Awesome! A gorgeous tag and a beautiful card. I love the color choices on both of them. Have a great weekend. 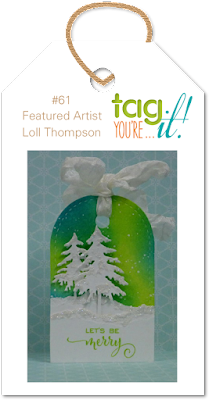 Gorgeous take on Loll's tag and I agree that image and your card are beautiful! Love your CASE of Loll's tag! Great sparkle! And also love your card with your favourite old traditional stamp - it's a fab image and you coloured it beautifully. Oh, your tag is incredible Darnell, just gorgeous!! The embossing on your card with the pop of bright blue is fabulous. Wonderful projects today!! Love that embossing on your holiday card. It really just makes that image pop. Love it! Wow what a beautiful tag, and I would never have guessed your ribbon was dyed with ink! Everything about this tag, from the serene landscap to the wonderful sentiment font, is just perfection! 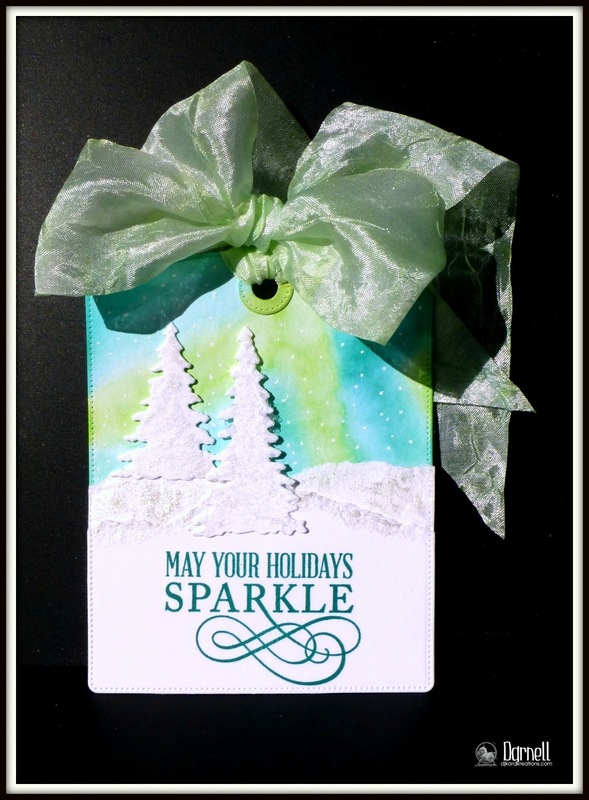 Two gorgeous festive makes Darnell ..... love the cute little tag with those sparkly trees. Love this tag, Darnell! You have captured Loll's background beautifully! Love that big bow! And your watercolor resist is so bright and festive! I love the non-traditional blue and your watercolor scene! Thanks so much for sharing with us at CAS Watercolour! Love your version of Loll's tag. The inking is gorgeous and beautiful. Love all the glittery trees as they look very frosty looking. 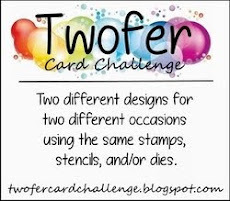 Your card is also a very lovely design and your have coloured that stamped image perfectly. Love and big hugs form my house to yours. Your tag and card are great. I did think it looked like Loll's and I love these non Christmasy colors I'm seeing this year. I'm glad the leak stopped. You can get a roll of plumbers tape for under a dollar and wrap it tight around the threads where it connects. That should do it. Oh the things I'm learning not stamp related! Oh how lovely. Your tag is gorgeous and you did a magnificent job of caseing Loll (she will be thrilled). The second card is equally as lovely. Keep on stamping! What a beautiful Tag Darnell and your bow is awesome!. 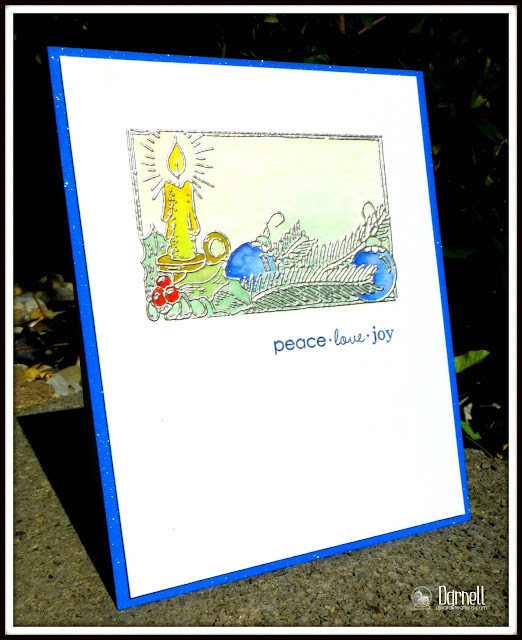 I can see why you love the beautiful stamp on your card - it is so crisp and festive! I love your twoefer. Nice stamp, and beautifully colored. Gorgeous tag, Darnell, and I'm not surprised you use the stamp on the card every year as it is just gorgeous. Two wonderful cards, and I really love the sweet image with the candles. Thanks so much for playing along at CASology this week. Gorgeous tag, Darnell. Those colors blended beautifully. I can see why you go back to that stamp for the second card year after year...its gorgeous and your watercoloring really bring it out. Love the pretty, soft coloring on your candle card, Darnell, and that embossing powder is gorgeous! Thanks for playing along with CASology this week! I can't comment on how that is like Loll's tag since I'm not familiar with her work, but I should be since so many of you reference her! I can say I was blown away by the image you used, that ribbon and how you tied it in the perfect bow. I really like the heat embossed card image too. That's a classic. My goodness your tag is beautiful! Love the blue and green background with the sparkly snow!!! Both projects are simply brilliant! Tag is wonderful, I love watercolor background and winter landscape. The second card took me speechless !! Incredible watercolor coloring sensational looks with silver embossing. Beautiful inspiration! Onfer - love the foo-foo bow cuz it seems to mimic the 'curly-swirly' scroll beneath the sentiment. Gorgeous colors and love the frosty glimmer on the trees! Twofer...such a heart warming, almost vintage image! Looks great embossed. Love the water color look on the pretty blue baubles! Hope your little Elf on the Shelf doesn't mess with your water again! Beautiful tag and lovely card. I'm knee deep in Christmas card makings myself. No light at the end of the tunnel yet!! Oh Darnell I love your tag, and yes, I was wondering why it seemed familiar. Love your card too - it is really beautiful. Fabulous tag Darnell, the card is brilliant with the embossed outlines and lovely colours. I certainly understand why you use it every year, it's a pure delight. I hope there won't be any leaks at all! Love your pretty, glittery tag Darnell - it really does shimmer! And I can see why that stamp gets an inking each year - it looks fabulous in the silver with the splashes of Zig colour! Oh please don't remind me another week has whooshed by .... how did it happen? :) Beautiful creations and those colors on your tag are just gorgeous! Lovely tag and beautiful Christmas scene colored with your Ziggies. Darnell, the tag is FANTABULOUS! Oh, the sparkle, be still my heart! And your classic card for CASology...I can see why you use that stamp every year, it is a classic and your sift colors and beautiful embossing are delightful. Love the blue sparkle paper, too! So glad you joined in the fun at CASology! I knew right away what challenge that tag was for, Darnell. You did Loll proud with your CASE of her tag. I can see why you love that candle stamp. It a beautiful scene that could be done in a variety of colors. Your tag looks great; you nailed that case! And I love those vibrant colours! The weekend has whoosed also and I am in my last prepaires for Sinterklaas this evening (the evening/day that we give eachother presents and spent some time with reading the little teasering or funny poems that we made with the presents. Some would even make "surprises"= a gift packed in a self-made shape that reflects something out of the life of the reciever, but with the school and studies here we keep it to presents, poems and have a family night...) Looking forward to tonight! Your card is beautifully coloured! Think we all have such a stamp that we like, but not seem to get "right" on a card :)! Have a good and colourfull week! 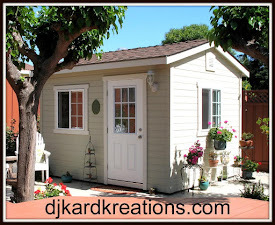 Thanks for your lovely comment on my blog :) Your platinum embossing is so gorgeous - off to check out your playhouse - looks like a great spot:) Cheers! Darnell your TYI card is beutiful, I knew as soon as I saw it that you did it for Tag You're It! Very obviously inspired by Loll but with your own fabulous twist! On to CASology and the embossed and zigged candles, so cool. Thank you for sharing with us at both Tag You're It and CASology this week!! Love that tag the colours are beautiful. Great embossing too. Darnell, that watercolor card is so CAS yet full of pops of color! Very pretty card. Thanks for joining us at CASology this week! Awesome job! Many thanks for joining us at Tag You're It Challenge. 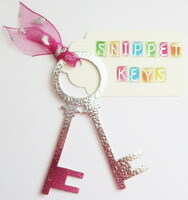 Gorgeous sparkly tag! And so glad you played along, again at TYI! Your tag is just amazing, Darnell! Inking up your ribbon was a beautiful idea and your background is gorgeous! I love the snowy hills and trees, and your sentiment is perfect too. Thanks for joining in on the fun over at Tag, You're It! Oh my ~ The tree scene is gorgeous on the amazing tag and your water coloring is beautiful on the silver embossed image! This is so beautiful. I loved the inky sky...so pretty! Congratulations, Darnell! Great Outstanding Design at CAS Watercolor!